Parrots magazine is now in its 23rd year and is the leading avian magazine dealing exclusively with parrots and parakeets. Our readers know that Parrots is the only magazine that addresses the many issues and all the latest information about parrots and parakeets. Advertising in Parrots offers a unique opportunity to promote products and services directly to parrot owners, breeders and avian professionals, both in the UK and worldwide. We offer a free design service for advertisements. 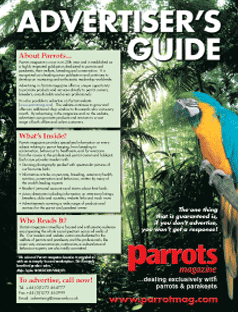 Parrots magazine is read by committed parrot owners and is highly regarded by avian professionals globally. It reaches its readers through major high street newsagents such as WH Smith and Pets at Home, as well as independent newsagents. It is also available through independent pet shops, subscriptions, bookstores, veterinary practices, trade shows and the Internet. Parrots provides specialised information on every subject relating to parrot keeping, covering breeding, healthcare, conservation, behaviour, reader's stories and much more, written by many of the world’s leading aviculturalists, for everyone from the novice to the most experienced professional parrot owners. 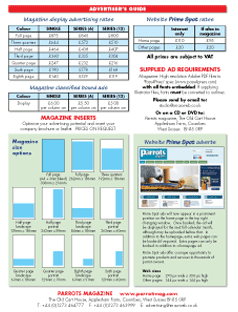 Please click to download our Advertiser's Guide in PDF format. Our eMag version of the magazine is downloadable and has links to all advertisers' websites - a demo version is available here free of charge.